Kasha Ki Aasha not only brings internationally acclaimed musicians to Pondicherry, we also to present the most exciting emerging artists from across the country. These guys are going to knock your socks off…well, we don’t wear socks in Pondy much, so maybe we should say they will knock you off your chairs! 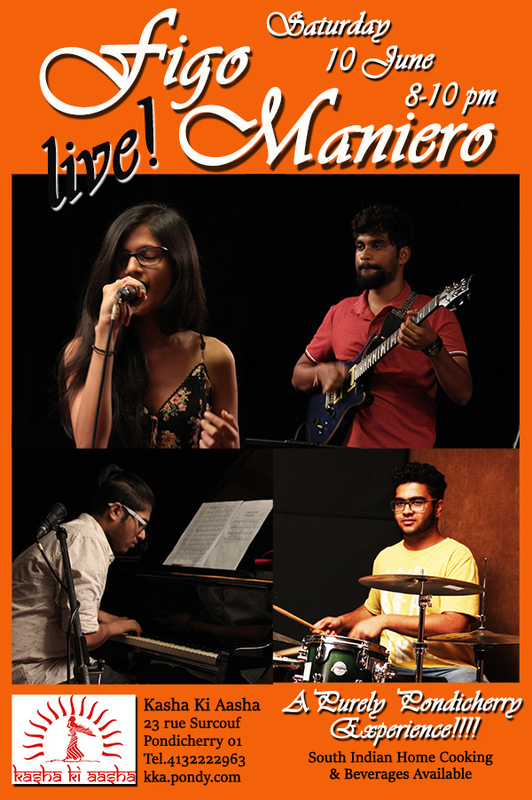 Looking forward to featuring Figo Maniero at Kasha Ki Aasha this Saturday evening at 8 pm. Come chill out with us again this week on our breezy terrace…there is no better place to experience great music than at Kasha Ki Aasha. We have a dinner menu and a license on Saturdays, so come enjoy. Kasha Ki Aasha, 23 rue Surcouf, Pondy 01. You can call us at 413 222 2963 but we don’t accept reservations after 730 pm. First come, best seats is how it works! ← Kasha Ki Aasha featured in the NEW Veg Planet Magazine!